One of the hardest obstacles a company or organization faces when utilizing social media to illicit specific calls to action is sustaining that initial level of excitement through the entire duration of the campaign. With the world teeming with so many people who care and want to do good things, why do so many campaigns fall short? 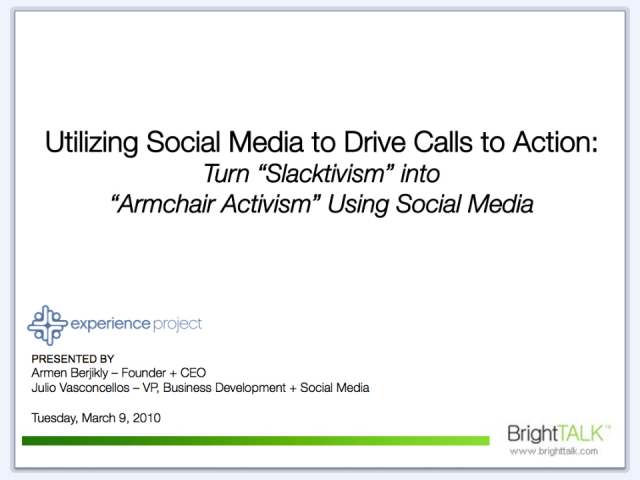 This presentation will take an in-depth look at social media tactics for maximizing call to action. The presenters will take a step-by-step approach walking attendees through several key elements including: targeting the right people, the value of mixing online and offline activities and injecting core messages into conversations already taking place on the Web. In addition, they will share real-world examples from recent national campaigns.